The overall health of Sequatchie County residents continues to improve in the Robert Wood Foundation health rankings since Erlanger Health System opened the Erlanger Sequatchie Valley Emergency Room in July 2014, officials said. Today, Sequatchie County ranks 33 in overall health out of 95 Tennessee counties, up from 68 in 2017 and 91 in 2013. "After the 2010 closure of the county’s only hospital, Sequatchie County’s health rankings sank to 91 out of 95 Tennessee counties," officials said. "With no access to local health care services, the rural community’s 15,000 residents typically postponed or avoided making the 35-mile trip to Chattanooga for routine healthcare. Delayed care often resulted in acute emergencies requiring hospitalizations. By 2013, Sequatchie residents were twice as likely as residents of neighboring counties to be hospitalized. "In 2013, elected officials in Sequatchie County approached Erlanger, the nation’s tenth largest public health system, about bringing health services to the community. After months of planning and negotiations, Erlanger developed a unique program that called for opening a 24/7 emergency facility in Dunlap. This free-standing Emergency Room serves as an extension of Erlanger Bledsoe Hospital, a critical access hospital located 22 miles away in Pikeville." "Upon opening in 2014 the facility immediately fulfilled healthcare needs in the community," officials said. 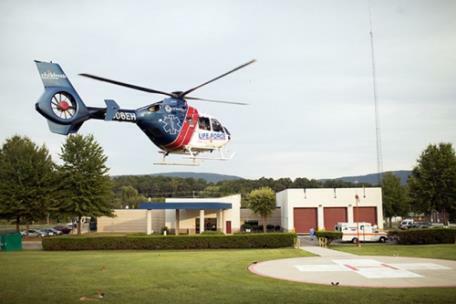 "Within 10 hours of opening its doors, the center had treated 13 patients with medical emergencies, and one of those was flown by LIFE FORCE to Erlanger’s main campus in Chattanooga. "Breathing life back into the town, elected officials were better able to attract new businesses to the area with the ability to offer local healthcare services. Today, health care challenges and collaborative solutions are discussed during quarterly roundtable meetings with elected officials. Local physicians volunteer to speak about important health topics at the county commission meetings as part of Erlanger’s 'Health Notes,' a program to promote awareness of community health issues. Erlanger specialists also meet with area practitioners to assure that specialty care is available and accessible. "The Health Service and Development Agency for the State of Tennessee noted the Erlanger-Sequatchie County partnership is 'one of the most innovative programs' ever developed in delivering healthcare to rural communities. Moreover, Erlanger is working with the Southeast Area Development District to replicate the program in other rural counties, and has been asked to offer guidance to other states and counties on the development of similar programs."